The enterprise mobility business of Motorola, Inc. released the PD8750 series of PCI PED-approved interactive payment terminals with fully integrated debit, credit, smart card and contactless payment capabilities. The new terminal allows accurate transaction processing, regardless of which way the card is swiped and also supports both finger and stylus pen touch. In addition, Motorola feels that the new PD8750 allows retailers to deliver real-time digital advertising – providing the customer with targeted information at point-of-sale with its crisp color display. HOLTSVILLE, N.Y., 18 December 2008 – The enterprise mobility business of Motorola, Inc. (NYSE: MOT) today announced the PD8750 series of PCI PED-approved interactive payment terminals with fully integrated debit, credit, smart card and contactless payment capabilities. The new payment terminal is ideal for multi-lane retailers seeking to help increase customer loyalty with fast, secure payment processing. Designed to speed customers through the checkout, the PD8750 helps to ensure fast, accurate transaction processing, regardless of which way the card is swiped. And with support for both finger and stylus pen touch, the PD8750 delivers quality signature capture and reliable PIN entry. In addition, the new PD8750 is equipped with a crisp color display which allows retailers to deliver real-time digital advertising – providing the customer with targeted information at point-of-sale. 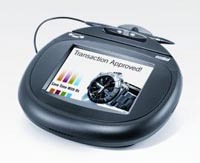 The new payment terminals meet the strict security requirements set by PCI PED. In addition, the PD8750 has received Interac Association Chip 2.0 PED Device Certification for use within the Interac Direct Payment (IDP) network. The new payment terminals incorporate the industry’s only dual head magnetic stripe readers which reduces the need for customers to swipe their cards more than one time and speeds them through the checkout lane. Motorola offers a full complement of Enterprise Mobility Services to keep the PD8750 operating at peak performance throughout its lifecycle. The PD8750 is eligible for Service from the Start Service Center Support, a prepaid program that delivers multiple years of seamless coverage and rapid in-house product repair through Motorola’s support centers and world-class service centers. Purchased up front with the payment system, this service provides access to technical support resources, state-of-the-art diagnostics and a rigorous adherence to repair protocols to help ensure customers derive full value from their investment in our technology. The PD8750 is expected to be available in North America in the first quarter of 2008 through Motorola sales, as well as select Motorola business partners.